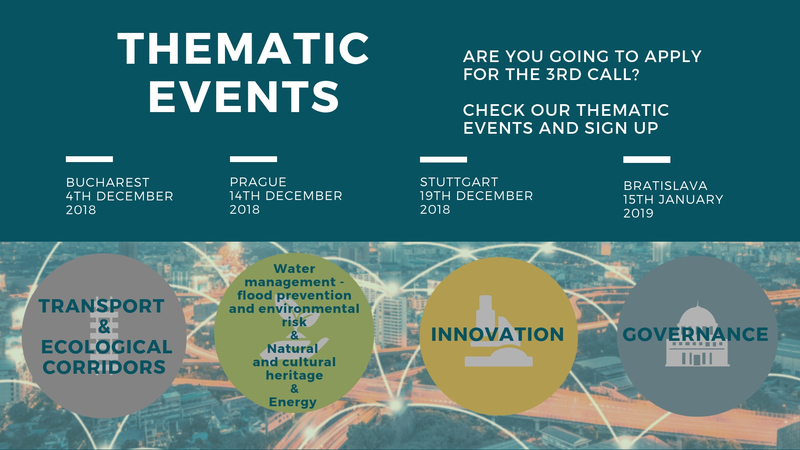 In view of the 3rd call, the DTP is organising four thematic events addressing topics relevant to the DTP Priority Areas (i.e. innovation, environment, accessibility, governance). The events will be organised in four different countries of the programme area, in order to allow a wider participation of relevant stakeholders. Are you going to apply for the 3rd call? Do you want to contribute and/or improve your understanding of selected topic(s)? Do you want to learn more what’s been going on in the Danube region in regard to the topic(s) of your interest and thus improve your application content-wise? Get the most of these events by starting in time. Find interested project partners, give your project more visibility and obtain potential feedback by sharing your project idea here. Potential applicants will be supported by their National Contact Points, as well, through organisation of national info days. Check here the dates and locations.